Exponential Organizations is not just the title of one of the best-selling business books of the year. These types of organizations actually do exist. Further, an exponential organization can be beneficial to entrepreneurs like yourself in a number of different ways. Learn all about exponential organizations and the characteristics that define these business structures below. An exponential organization is a business model that reaches a large audience relative to its own small business structure. Simply put, businesses that have few employees relative to the number of consumers they reach are considered exponential businesses. These lean management strategies are used as a means of growing startups, not a Papa John’s franchise. Once you understand what types of businesses exponential organizations are, then you can begin to look at their shared characteristics. Exponential business is rooted in the concept of managing scarcity. These organizations learn to manage scarce amounts of employees, resources and assets while operating a profitable business model. Because they are able to survive, or even thrive, despite having few employees or assets and a tight budget, why would they function any differently? That is why an exponential business model is always rooted in managing scarcity. Collaboration is a key requirement in order to become an exponential organization. These types of organizations foster a sense of community. Within that community, big objectives are achieve through collaboration, not just small topics like company party ideas. Everyone works as a team to achieve company goals. That is what makes these business structures capable of performing beyond what others believe to be their potential. If you want your startup to be an exponential company, collaboration is a must. A culture of experimentation is a common element found in all exponential organizations. These businesses allow employees to make mistakes, as long as they learn from them. In addition, they have a quick feedback loop to enable responsive management members to coach employees after mistakes are made. That means employees learn from those mistakes much quicker. An experimental business culture is a required element for exponential models. In order to become an exponential organization, a business must utilize and embrace technology to help achieve objectives. Business software is a common threat found in all these lean organizations. These business applications streamline workflows to maximize efficiency and make employees more productive. That is what enables exponential companies to manage scarcity successfully. Business technologies are an integral part of all exponential organizations. If you are an entrepreneur, it is good to learn about all different business models. Different types of business organizational structures operate differently. That means that they achieve success in vastly different ways too. 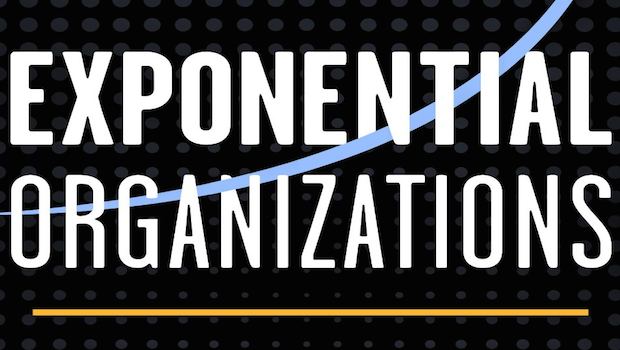 Use this post as a guide to exponential organizations. These exponential business structures are lean and agile by using coworking tactics and other collaborative ideas. That gives entrepreneurs like you added flexibility when trying to achieve success.